Whenever we read or get to know about the Mughal history, the name Dai Anga does come across but have you ever gone into the details of this important personality? Well, here I am taking you to a forgotten piece of architecture which was a mosque built by Dai Anga, but before that, let me tell you a little about Dai Anga. Dai Anga was well respected in the royal family and her original name was Zeb-un-Nisa and was also the wet nurse of the Mughal Emperor, Shah Jahan. According to historic references it is said that her family was closely connected with the Mughal Empire and had served them for ages. Dai Anga’s husband Murad Khan served Emperor Jahangir as Magistrate of Bikaner, and her son Muhammad Rashid Khan, was the best archers in the Mughal kingdom. It is also said that the son of Dai Anga died while fighting in the service of Shah Jahan’s eldest son Dara Shikoh. Dai Anga during her life time made a Mosque in Lahore and later her tomb was also built in Lahore on the Grand Trunk Road which is also known as Gulabi Bagh gateway. I am surprised at times that having such importance in Mughal History, the marks of Dai Anga are forgotten and most of us living in Lahore do not know about these places. Unfortunately, the tomb of Dai Anga and the Mosque which are both at different locations, are not visited by many as these are not the tourist sites nor these are much highlighted, but trust me these are masterpieces and one must visit them to see the taste of the artisans of those times. Now come to the mosque of Dai Anga which is said to be one of the city’s best-used mosques of that period. 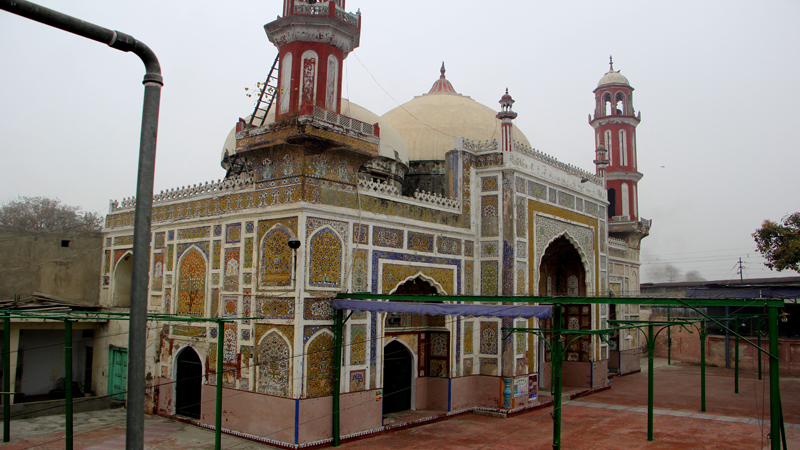 This colourful and majestic mosque is located in the Naulakha area, southeast of Lahore railway station, which is one of the oldest stations and has witnessed the seasons of turbulence and tranquility in Lahore. The location of the mosque is of immense importance and while visiting it you will notice that it is very close to the Lahore Fort. To get to this mosque you will have to manage your way through heavy traffic around the area and on your way you can ask any local about the directions as well. A simpler route could be from Nicholson Road from Qila Gujjar Singh Chowk, and going straight across Allama Iqbal Road, passing the Presbyterian Church and Boharwala Chowk a narrow road turning left can lead you to this mosque. As soon as you get to see this mosque you will be awe stunned by the impressive and marvelous structure of Dai Anga’s Mosque. Although a lot of restoration work and additions have been carried out on the building making it look like a structure of later Mughal period but the exquisiteness and magnificence of the structure cannot be ignored. Now let me tell you a little about the majestic architecture of this mosque which till now could not be highlighted as a tourist spot or a masterpiece of Mughal era. According to the architects the design of the Mosque is based on a single aisle three bay plan form and the architects consider it as a simplified shape of the extravagant Mosques which were built by the Mughals. In my opinion, it is no less embellished than the other mosque which I see in Lahore belonging to Mughal era. More surprises are there for you in the interior of the mosque especially the striking prayer chamber. This prayer hall is divided into three compartments and the central part has exceptionally rich decoration and this is a pattern that we find in many of the Mughal era Mosques. This part is crowned with a high dome and the side bays have double domes. Similar thing can be observed in the Wazir Khan Mosque as well, and to me it seems similar because of the colours and calligraphy. You will further notice that the exterior surface of the projection, as well as the flanking compartments, have been divided into numerous decorative panels of various shapes, sizes, and designs and filled with fluoridate patterns created by means of mosaic kashi kari. The dominant colours used in the tile work, here as well as in the interior panels, are blue, orange, and yellow which are again seen in many of the Mughal era Mosques and especially the ones during Shah Jahan period. Further you can notice that the division of facade into panels, embellished with dazzling multicoloured tile mosaic, a much loved decorative medium during Shah Jahan’s days, produces one of the most extravagant facades of that period. 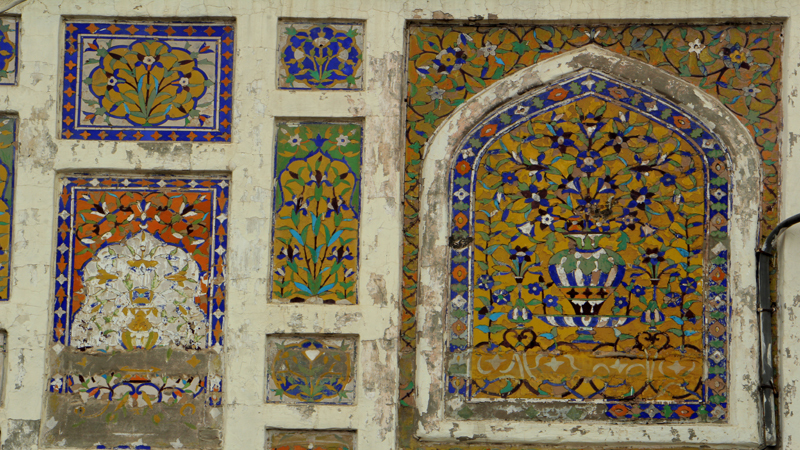 You will see the similar treatment in Wazir Khan Mosque as well which is in walled City’s Delhi Gate. The domes are plastered, but possess pronounced cavettos, reminiscent of similar treatment at the Moti Mosque of Lahore Fort. The tall minarets rising from a square base on the two front extremities are terminated with kiosk-like structures having cupolas. The platform of the Mosque, once part of the Mosque’s courtyard, is paved with beautifully laid brick flooring divided into a simple square pattern. Within the courtyard in which the building stands, an ablution tank has been found, and traces exist of what may prove to be a second tank. From history notes we get to know that the Mosque was built in 1635 AD, before Dai Anga went to perform Hajj and the inscription on the Mosque says that it was built in 1649 AD. This is a functional mosque and the five prayers are offered there. Like many other Mughal era monuments this mosque also saw several ups and downs after the downfall of the Mughal Empire. It was converted into a military depot by Maharaja Ranjit Singh. When the British rule took over Henry Cope the editor of the newspaper ‘Lahore Chronicle’ used it as residence. However, later when the area, once known as Mohallah Dai Anga and populated by Mughal nobility, was acquired by the Punjab and Delhi Railway Henry Cope sold it to them for Rs 12,000, and they converted it into the office of the traffic manager, Punjab Northern State Railway. After Lord Curzon expressed his dismay at the dishonoured treatment of the mosque and many other Mughal mosques, somewhere in 1903 Dai Anga’s Mosque was returned to the Muslims. Like many other monuments lying abandoned in Lahore, this piece of Mughal era is also going unnoticed since ages. There could have been a tourist spot at this place with trained tourist guides who could narrate the stories of the past to tourists and visitors. I hope one day this place will also get the due value and projection which it deserves.